You can achieve this in a few simple steps. 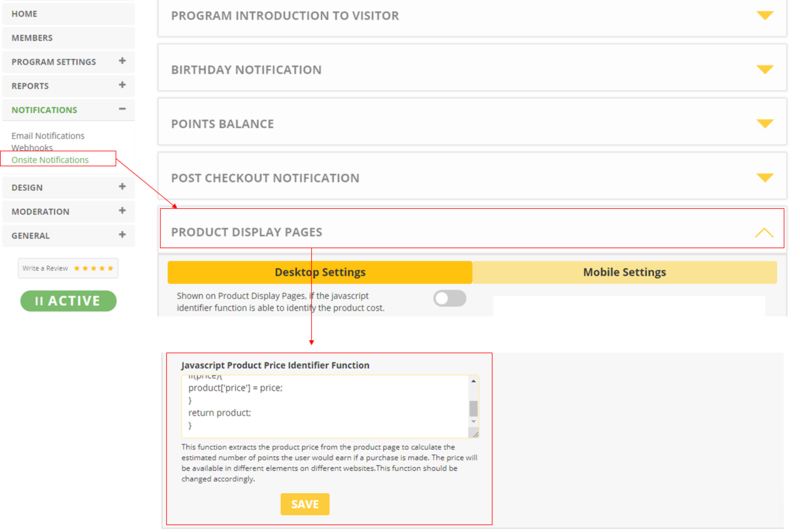 Navigate to Notifications >> On-site Notifications >> Product Display Pages. Here is a sample script that you can use to get started. To display the points on the page, Zinrelo provides a pre-defined HTML attribute which can be embedded anywhere on the page. Here is a sample HTML code that added to the product pages. You can change the text to suit your page. Zinrelo will scan the <div> element with the attribute name data-zrl-product-points and it will replace that div with the number of points that a user will earn for purchasing that product . Once Steps 1-4 are completed, test the points display on various pages and ensure that the points are being displayed correctly. Displaying loyalty rewards points on product pages can significantly enhance conversion and rewards program awareness.